The Vesteal Series has sold over five thousand hardcover copies through hard-earned convention handsales. Now, the story is moving into the digital age with cover art by Hugo award-winning artist, Elizabeth Leggett. 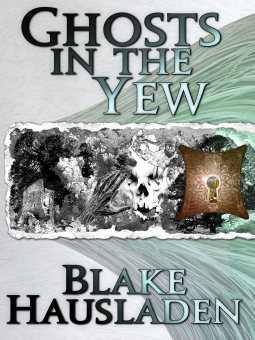 Ghosts in the Yew is a page-turning epic fantasy about a country on the brink of war, surrounded by the mysteries of ancient gods, blood magic, and statecraft. This is the story of four souls that are banished beyond the edge of the map. Redemption, conquest, and intrigue ignite the journey with love, honor, and a crown at stake. Their struggles to survive will put them at odds with their families, their nation, and the very powers that shaped the world. But, this story is bigger than these things. It’s bigger than all of us. A tale of violent magic, intrigue, and statecraft, the Vesteal Series is the story of four souls that are banished beyond the edge of the map to a land of gnarled forests, ancient magic, and the site of a terrible murder. Their struggles to survive will put them at odds with their families, their nation, and the very powers that shaped the world. Fueled by two successful Kickstarters and 10,000 hardcover handsales at Midwest science-fiction and fantasy conventions, the Vesteal Series has moved online with new cover art from Hugo Award winner Elizabeth Leggett.